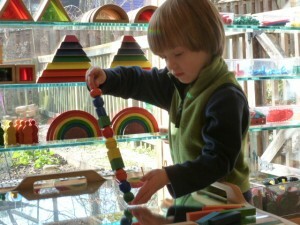 Math for young children is about recognizing patterns, comparing, quantifying, measuring and making order. Practicing processes like counting, sorting, seriating, charting, adding and subtracting can feel pretty empowering to children working hard to make sense of a complicated world. 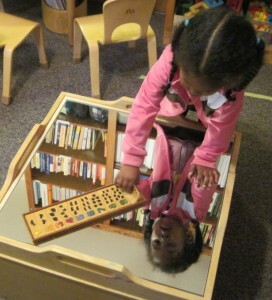 In the course of their play, children think constantly about mathematical questions — How do these pieces fit together? How tall will this be if I use all the blocks? How much water will it take to fill my bottle? If the white car went this far, how far will the green car go? 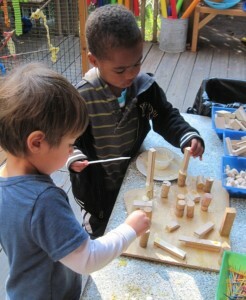 How many corks will I need to make my tower as tall as yours? They also think with great intensity about social mathematical issues. Whose tower is taller? 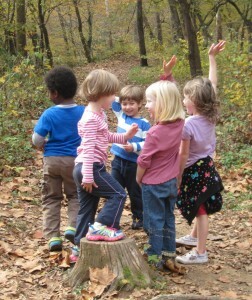 How many girls at the Eno, and how many boys? Who’s the oldest at this table? What do you mean, I’m supposed to divide this clay in half? Do I have enough pretzels in my lunch to share with everybody at my table? Who has the tallest parent in the school? How many days until I’m the meeting leader? Whose [anything!] matches mine? To support children in their mathematical quest for order, we provide lots of things to match, to sort, and to seriate by size, color or other properties. 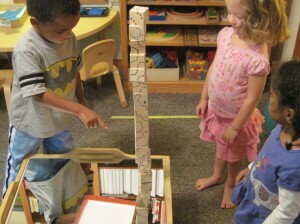 And our storage systems make clean up another exercise in matching by shape, sorting by color or sequencing by size. Our kids create patterns and shapes with many different kinds of building materials, and do a lot of puzzles which require spatial reasoning. Indoors and out, they use containers of various sizes and shapes with water, mud and sand for direct experience with volume. They use tools for measuring themselves, the plants they are growing, and the ingredients in recipes they are putting together. Calendars help them think about time, and give them a way to count the days until the next important event in our community. 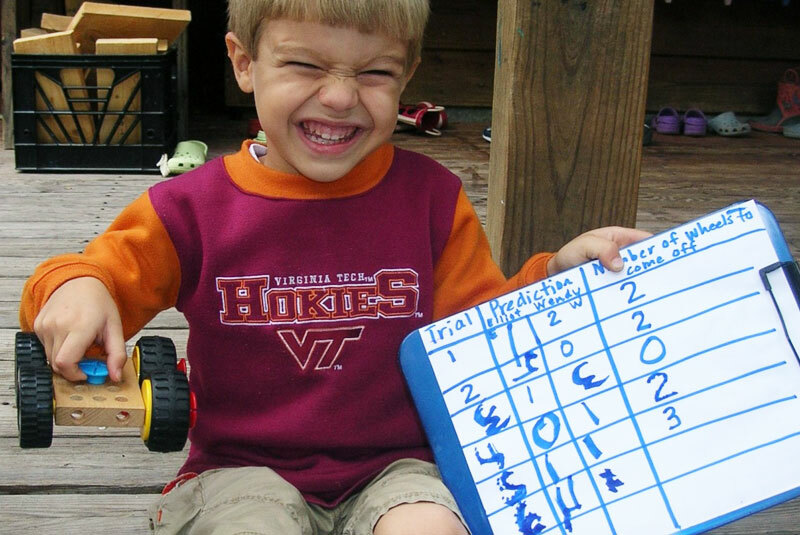 The classroom is “numeral-rich” as well as “print-rich”‘ – there are many numbers to recognize, name and write. 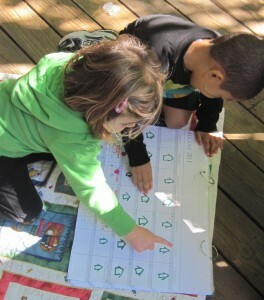 We vote and tally the results, and we conduct surveys and chart what we learn. We play games and work puzzles that require counting, comparing and number recognition. Do you know how many characters there are in my story? One, two, three, four. Four characters.